The islands in Eastern Polynesia have been characterized by the continuities among their cultures, and the short migration period would be an explanation of this result. Diversified agroforestry and aquaculture provided sustenance for Native Hawaiian cuisine. Tropical materials were adopted for housing. Elaborate temples (called heiau) were constructed from the lava rocks available. The rich natural resources supported a relatively dense population, organized by a ruling class and social system with religious leaders. Captain James Cook made the first known European contact with ancient Hawaiians in 1778. He was followed by many other Europeans and Americans. Priests traveling across Kealakekua Bay for first contact rituals. Each helmet is a gourd, with foliage and tapa strip decoration. A feather-surrounded akua is in the arms of the priest at the center of the engraving. There have been changing views about initial Polynesian discovery and settlement of Hawai'i. Radiocarbon dating in Hawai'i initially indicated a possible settlement as early as 124 CE. Patrick Vinton Kirch's books on Hawaiian archeology, standard textbooks, date the first Polynesian settlements to about 300 with more recent suggestions by Kirch as late as 600. Other theories suggest dating as late as 700 to 800. In 2010 researchers announced new findings using revised, high-precision radiocarbon dating based on more reliable samples than were previously used in many dating studies. This new data indicates that the period of eastern and northern Polynesian colonization took place much later, in a shorter time frame of two waves: the "earliest in the Society Islands c. 1025 – 1120, four centuries later than previously assumed; then after 70–265 y, dispersal continued in one major pulse to all remaining islands c. 1190 – 1290." According to this research, settlement of the Hawaiian Islands took place circa 1219–1266. This rapid colonization is believed to account for the "remarkable uniformity of East Polynesia culture, biology and language." According to Hawaiian mythology, there were other settlers in Hawaiʻi, peoples who were forced back into remote valleys by newer arrivals. They claim that stories about menehune, little people who built heiau and fishponds, prove the existence of ancient peoples who settled the islands before the Hawaiians. The Pacific rat accompanied humans on their journey to Hawaiʻi. David Burney argues that humans, along with the vertebrate animals they brought with them (pigs, dogs, chickens and rats), caused many native species of birds, plants and large land snails to become extinct in the process of colonization. Estuaries and streams were adapted into fishponds by early Polynesian settlers, as long ago as 500 CE or earlier. Packed earth and cut stone were used to create habitat, making ancient Hawaiian aquaculture among the most advanced of the original peoples of the Pacific. A notable example is the Menehune Fishpond dating from at least 1,000 years ago, at Alekoko. At the time of Captain James Cook's arrival, there were at least 360 fishponds producing 2,000,000 pounds (900,000 kg) of fish per year. Over the course of the last millennium, Hawaiians undertook "large-scale canal-fed pond field irrigation" projects for kalo (taro) cultivation. As soon as they arrived, the new settlers built hale (homes) and heiau (temples). Archaeologists currently believe that the first settlements were on the southern end of the Big Island of Hawaiʻi and that they quickly extended northwards, along the seacoasts and the easily accessible river valleys. As the population increased, settlements were made further inland. At this time, with the islands being so small, the population was very dense. Before European contact, the population had reached somewhere in the range of 200,000 to 1,000,000 people. After contact with the Europeans, however, the population steeply dropped due to various diseases including smallpox. Heiau, temple to the gods. There were two major types. The agricultural mapele type was dedicated to Lono, and could be built by the nobility, priests, and land division chiefs, and whose ceremonies were open to all. The second type, luakini, were large war temples, where animal and human sacrifices were made. They were built on high-rising stone terraces and adorned with wood and stone carved idols. A source of great mana or divine power, the luakini could only be entered by aliʻi, the king, important chiefs and nobility, and kahuna who were members of the Kū priesthood. Hale aliʻi, the house of the chief. It was used as a residence for the high chief and meeting house of the lesser chiefs. It was always built on a raised stone foundation to represent high social standing. Kāhili, or feather standards, were placed outside to signify royalty. Women and children were banned from entering. Hale mua, the men's eating house. 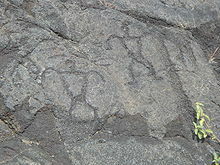 It was considered a sacred place because it was used to carve stone idols of ʻaumakua or ancestral gods. Men and women could not eat with each other for fear that men were vulnerable while eating to have their mana, or divine spirit, stolen by women. Women ate at their own separate eating house called the hale ʻaina. The design was meant for the men to be able to enter and exit quickly. Imu, the communal earth oven. Dug in the ground, it was used to cook the entire village's food including puaʻa or pork. Only men cooked using the imu. 18th century Hawaiian helmet and cloak, signs of royalty. Aliʻi. This class consisted of the high and lesser chiefs of the realms. They governed with divine power called mana. Makaʻāinana. Commoners farmed, fished, and exercised the simpler crafts. They labored not only for themselves and their families, but to support the chiefs and kahuna. Hawaiian youth learned life skills and religion at home, often with grandparents. For "bright" children  a system of apprenticeship existed in which very young students would begin learning a craft or profession by assisting an expert, or kahuna. As spiritual powers were perceived by Hawaiians to imbue all of nature, experts in many fields of work were known as kahuna, a term commonly understood to mean priest. The various types of kahuna passed on knowledge of their profession, be it in "genealogies, or mele, or herb medicine, or canoe building, or land boundaries," etc. by involving and instructing apprentices in their work. More formal schools existed for the study of hula, and likely for the study of higher levels of sacred knowledge. The kahuna took the apprentice into his household as a member of the family, although often "the tutor was a relative". During a religious "graduation" ceremony, "the teacher consecrated the pupil, who thereafter was one with the teacher in psychic relationship as definite and obligatory as blood relationship." Like the children learning from their grandparents, children who were apprentices learned by watching and participating in daily life. Children were discouraged from asking questions in traditional Hawaiian culture. In Hawaiian ideology, one does not "own" the land, but merely dwells on it. The belief was that both the land and the gods were immortal. This then informed the belief that land was also godly, and therefore above mortal and ungodly humans, and humans therefore could not own land. The Hawaiians thought that all land belonged to the gods (akua). The aliʻi were believed to be "managers" of land. That is, they controlled those who worked on the land, the makaʻāinana. On the death of one chief and the accession of another, lands were re-apportioned—some of the previous "managers" would lose their lands, and others would gain them. Lands were also re-apportioned when one chief defeated another and re-distributed the conquered lands as rewards to his warriors. In practice, commoners had some security against capricious re-possession of their houses and farms. They were usually left in place, to pay tribute and supply labor to a new chief, under the supervision of a new konohiki, or overseer. This system of land tenure is similar to the feudal system prevalent in Europe during the Middle Ages. The ancient Hawaiians had the ahupuaʻa as their source of water management. Each ahupuaʻa had a sub-division of land from the mountain to the sea. The Hawaiians used the water from the rain that ran through the mountains as a form of irrigation. Hawaiians also settled around these parts of the land because of the farming that was done. Religion held ancient Hawaiian society together, affecting habits, lifestyles, work methods, social policy and law. The legal system was based on religious kapu, or taboos. There was a correct way to live, to worship, and even to eat. Examples of kapu included the provision that men and women could not eat together (ʻAikapu religion). Fishing was limited to specified seasons of the year. The shadow of the aliʻi must not be touched as it was stealing his mana. The rigidity of the kapu system might have come from a second wave of migrations in 1000–1300 from which different religions and systems were shared between Hawaiʻi and the Society Islands. Hawaiʻi would have been influenced by the Tahitian chiefs, the kapu system would have become stricter, and the social structure would have changed. Human sacrifice would have become a part of their new religious observance, and the aliʻi would have gained more power over the counsel of experts on the islands. Kapu was derived from traditions and beliefs from Hawaiian worship of gods, demigods and ancestral mana. The forces of nature were personified as the main gods of Kū (God of War), Kāne (God of Light and Life), Kanaloa (God of Death), and Lono (God of peace and growth). Well-known lesser gods include Pele (Goddess of Fire) and her sister Hiʻiaka (Goddess of Dance). In a famous creation story, the demigod Māui fished the islands of Hawaiʻi from the sea after a little mistake he made on a fishing trip. From Haleakalā, Māui ensnared the sun in another story, forcing him to slow down so there were equal periods of darkness and light each day. The Hawaiian mystical worldview allows for different gods and spirits to imbue any aspect of the natural world. From this mystical perspective, in addition to his presence in lightning and rainbows, the God of Light and Life, Kāne, can be present in rain and clouds and a peaceful breeze (typically the "home" of Lono). Although all food and drink had religious significance to the ancient Hawaiians, special cultural emphasis was placed on ʻawa (kava) due to its narcotic properties. This root-based beverage, a psychoactive and a relaxant, was used to consecrate meals and commemorate ceremonies. It is often referred to in Hawaiian chant. Different varieties of the root were used by different castes, and the brew served as an "introduction to mysticism". The four biggest islands, the island of Hawaiʻi, Maui, Kauaʻi and Oʻahu were generally ruled by their own aliʻi nui (supreme ruler) with lower ranking subordinate chiefs called aliʻi ʻaimoku, ruling individual districts with land agents called konohiki. All these dynasties were interrelated and regarded all the Hawaiian people (and possibly all humans) as descendants of legendary parents, Wākea (symbolizing the air) and his wife Papa (symbolizing the earth). Up to the late eighteenth century, the island of Hawaiʻi had been ruled by one line descended from Umi-a-Liloa. At the death of Keaweʻīkekahialiʻiokamoku, a lower ranking chief, Alapainui, overthrew the two sons of the former ruler who were next in line as the island's aliʻi nui. Assuming five to ten generations per century, the Aliʻi ʻAimoku dynasties were around three to six centuries old at 1800 CE. The Tahitian settlement of the Hawaiian islands is believed to have taken place in the thirteenth century. The aliʻi and other social castes were presumably established during this period. The ancient Hawaiian economy became complex over time. People began to specialize in specific skills. Generations of families became committed to certain careers: roof thatchers, house builders, stone grinders, bird catchers who would make the feather cloaks of the aliʻi, canoe builders. Soon, entire islands began to specialize in certain skilled trades. Oʻahu became the chief kapa (tapa bark cloth) manufacturer. Maui became the chief canoe manufacturer. The island of Hawaiʻi exchanged bales of dried fish. European contact with the Hawaiian islands marked the beginning of the end of the ancient Hawaiʻi period. In 1778, British Captain James Cook landed first on Kauaʻi, then sailed southwards to observe and explore the other islands in the chain. When he first arrived at Kealakekua Bay in 1779, some of the natives believed Cook was their god Lono. Cook's mast and sails coincidentally resembled the emblem (a mast and sheet of white kapa) that symbolized Lono in their religious rituals; the ships arrived during the Makahiki season dedicated to Lono. Captain Cook was eventually killed during a violent confrontation and left behind on the beach by his retreating sailors. The British demanded that his body be returned, but the Hawaiians had already performed funerary rituals of their tradition. Within a few decades Kamehameha I used European warfare tactics and some firearms and cannons to unite the islands into the Kingdom of Hawaiʻi. ^ a b Charles E.M. Pearce; F. M. Pearce (17 June 2010). Oceanic Migration: Paths, Sequence, Timing and Range of Prehistoric Migration in the Pacific and Indian Oceans. Springer Science & Business Media. p. 167. ISBN 978-90-481-3826-5. ^ Elvi W. Whittaker (January 1986). The Mainland Haole: The White Experience in Hawaii. Columbia University Press. p. 3. ISBN 978-0-231-05316-7. ^ Maclay, Kathleen (July 8, 2010). "Coral tests show fast construction pace for Polynesian temples". UC Berkeley. Berkeley News. Retrieved 2 April 2016. ^ The best survey of these stories, all collected in the latter part of the 19th century, is found in Beckwith's Hawaiian mythology, pp. 321–336. ^ Denham, Tim (February 5, 2013). "Ancient and historic dispersals of sweet potato in Oceania"". PNAS. 110 (6). doi:10.1073/pnas.1221569110. PMC 3568348. ^ a b Costa-Pierce, B.A. (1987). "Aquaculture in ancient Hawaii" (PDF). BioScience. 37 (5): 320–331. doi:10.2307/1310688. JSTOR 1310688. ^ Dye, Tom (1994). "Population Trends in Hawaiʻi Before 1778" (PDF). The Hawaiian Journal of History. 28: 1–20. ^ Linda W. Greene (1993). "Chapter 1, E.6.d". A Cultural History of Three Traditional Hawaiian Sites on the West Coast of Hawai'i Island. U.S. Department of the Interior, National Park Service, Denver Service Center. Retrieved 18 March 2018. ^ Rosenfeld, Alan. "Ancient Polynesia." 19 Nov. 2013. p.13. Lecture. Adams, Wanda A. (2006). "The Island Plate: 150 Years of Recipes and Food Lore from the Honolulu Advertiser". Waipahu, Hawaiʻi: Island Heritage Publishing. Finney, Ben R. (1994). Voyage of Rediscovery: A Cultural Odyssey Through Polynesia. University of California Press. ISBN 0-520-08002-5. Kane, Herb Kawainui (1998). Ancient Hawaii. Kawainui Press. ISBN 0-943357-03-9. Kirch, Patrick Vinton (2001). On the Road of the Winds: An Archaeological History of the Pacific Islands Before European Contact. University of California Press. ISBN 0-520-23461-8. Kirch, Patrick (2001). Hawaiki. Cambridge University Press. ISBN 978-0-521-78309-5. Luomala, Katherine (1951). The Menehune of Polynesia and Other Mythical Little People of Oceania. Bernice P. Bishop Museum Bulletin Vol. 203. "Hawaiian Historical Society". official web site. Retrieved May 12, 2010. "Hawaii History Community Learning Center". Archived from the original on April 12, 2010. Retrieved May 12, 2010. "European Influence in Ancient Hawaii". Archived from the original on 2011-07-08. Retrieved February 18, 2015. "Significant Dates in the History of Hawaiʻi". Hawaiian Historical Society. Archived from the original on 2010-01-24. Retrieved February 18, 2015.